Note that it is unfortunately not possible to export and import your data using KeePassX on Mac OS X. Please copy your database and use a Windows computer to export and import your data to Dashlane. 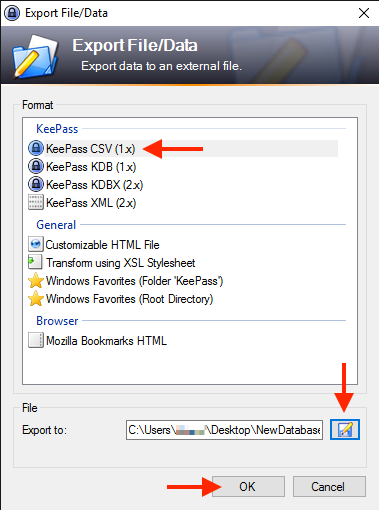 Click the File → Export menu in KeePass on Windows and select CSV. Still in KeePass, choose a location and a file name, then click Save, and click OK on the next page. Now open Dashlane and select File → Import Passwords → KeePass in the menu bar at the top of the screen or window. 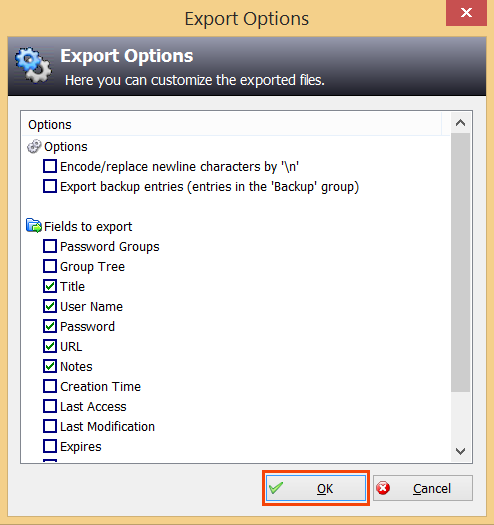 Select the file that has been exported from KeePass and click Open. 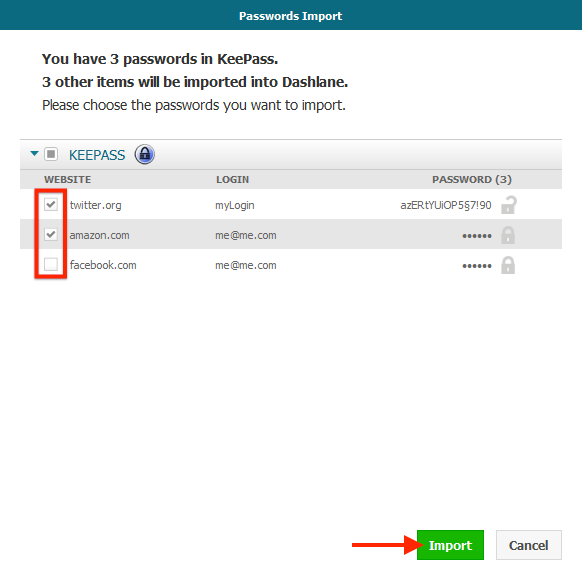 Check the passwords that you want to import in Dashlane and click Import. Don't forget to delete the unsecured exported file when you are finished importing it. 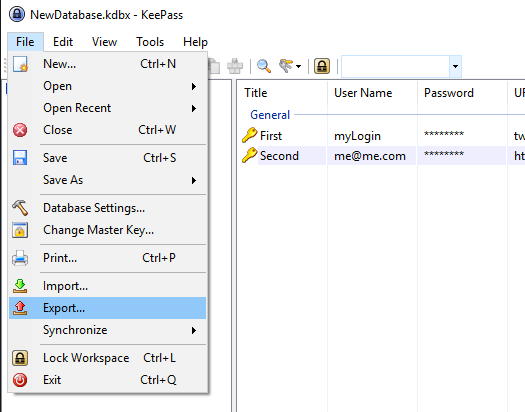 Click the File → Export menu in KeePass on Windows. In KeePass, click on the little save icon, at the bottom of the window, and select the location where the file will be saved, e.g., your Desktop. Select Save and click OK to confirm. Select the exported file and click Open. Check the passwords you want to import in Dashlane and click Import. Do not forget to delete the unsecured file that was exported when you are finished with it. 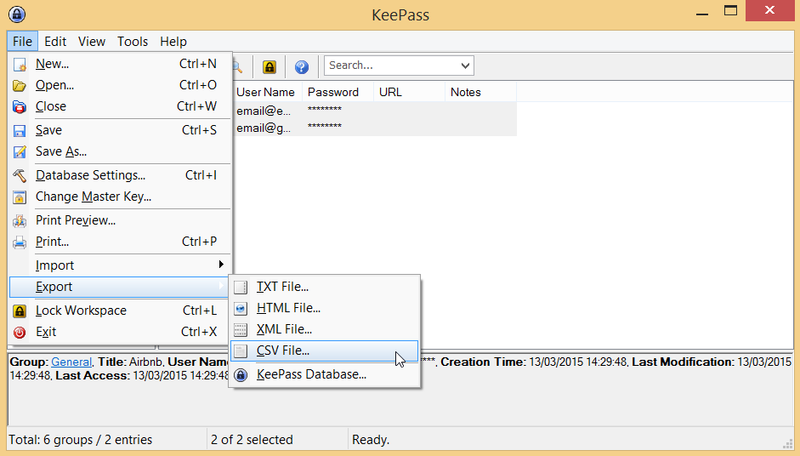 Export your data as an HTML or TXT file from KeePass. Open up Excel or any spreadsheet or text editor application. Copy the data from the text file or the HTML file, which you should be able to open and view in your browser, into a new spreadsheet. Make sure your data is formatted like on the screen shot below in Excel or any spreadsheet application. Important: the first row of your file must be: Password Groups,Account,Login Name,Password,Web Site,Comments and it must match your data. If the first row is labeled differently, change it in the file. If you opened the file in text format, here is how to format it. Important: the first row of your file must be: "Password Groups","Account","Login Name","Password","Web Site","Comments" and it must match your data. If the first row is labeled differently, change it in the file. 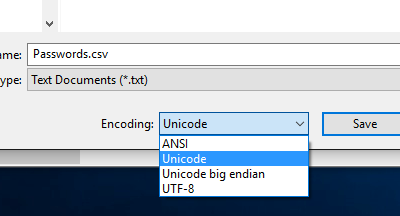 Now that your data is properly formatted, save this document into a .csv file and make sure that the encoding is Unicode. Open Dashlane on Windows and go to File → Import Passwords → Keepass and select this new CSV file you just created. 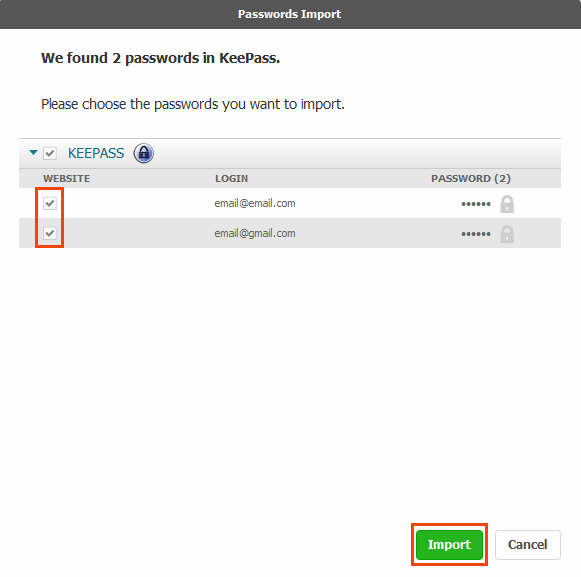 If you're unable to import from KeePass, please try to log out of Dashlane and reboot your computer. Then try to import from KeePass again.